Manoa Valley, home to Lyon Arboretum, is a short hop from the hubbub of downtown Honolulu and Waikiki, but it is eons away in terms of state of mind. The university-run botanical garden offers 200 acres of both manicured and wild greenery, with benches to contemplate the wonder of it all and a network of trails to get purposefully lost. The patio behind the gift shop and visitors center is at a perfect elevation above the floor of the valley—high enough so that the gardens slope downward in the foreground, while the jagged green ridge of the Ko'olau Range rises in the distance. Plantings date from 1918 and some big-boy trees shade a host of flowering trees and shrubs, including plants with leaves the size of surfboards. Lyon's entrance is very near the trailhead for Manoa Falls, a popular tourist trot, and also by the Treehouse Restaurant, a place to bag lunch afterwards. 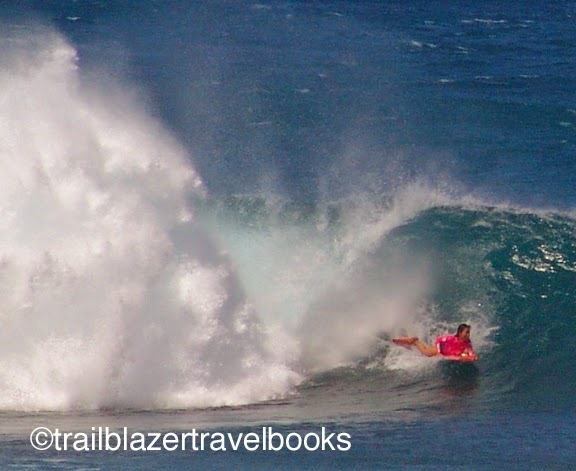 Oahu Trailblazer has deets beginning on page 78. 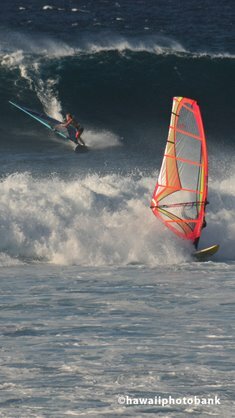 Thanks MagicSeaweed.com for the link. Jaws is quiet, Pipe has been pumping. 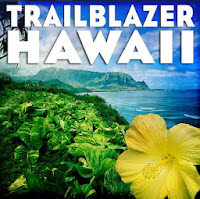 Did you know you can follow the Trailblazer Hawaii team on your Kindle? 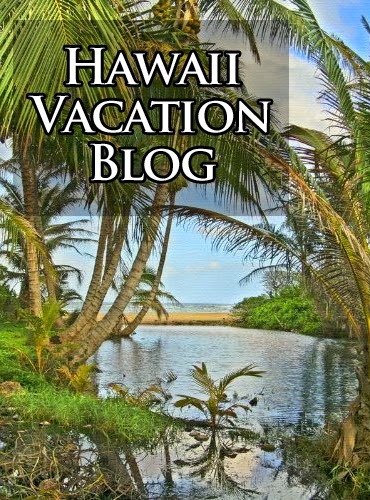 Here's your link for Hawaii Vacation Blog. "NEXT BEST THING TO BEING THERE"
"I write blog reviews for The Kindle Blog Report. The people who write this blog live in Hawaii, so they know what they're talking about. 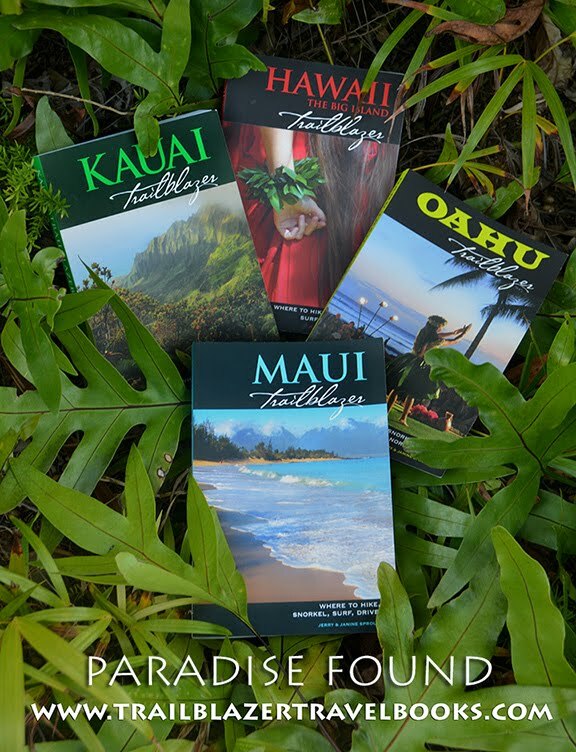 I heartily recommend this blog for anyone who intends to travel to the various islands of Hawaii, or who merely wants to read and wish they were there." 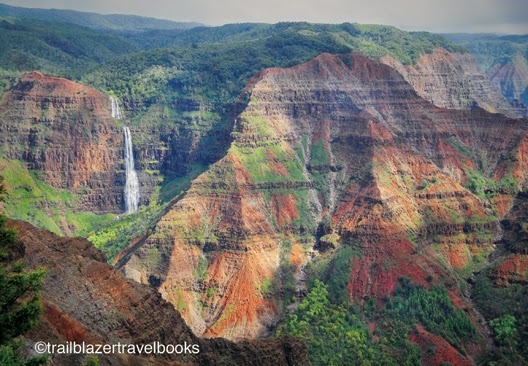 About 10 miles long and almost 4,000 feet deep, Waimea Canyon can stand alongside those geologic sites in the American Southwest as a scenic wonder. A rugged hunter's trail follows the river from sea level into the gorge—not an advisable route when tropical rains fall in the interior and send a churning deluge through the canyon. 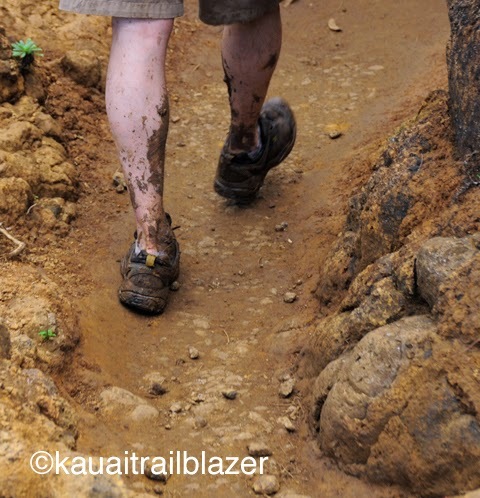 It's easier to reach the bottom via the Kukui Trail, which is off the road that climbs along the rim of the canyon, a trek of about five miles round-trip that drops more than 2,000 feet. This shot is from farther up the canyon on the Black Pipe Trail, part of a network of trails near Koke'e State Park. 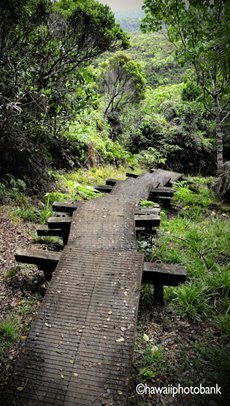 The trail connects with the Canyon Trail and crosses midway along the courseway of Waipo'o Falls. This place is a hiker's paradise. 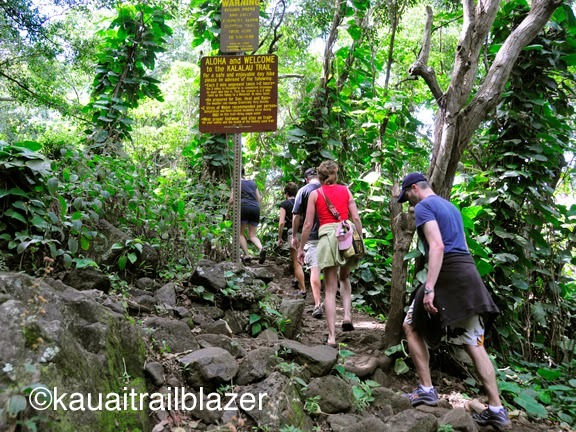 See Kauai Trailblazer pages 151-171 for canyon trails, as well as the many trails that radiate seaward along the Napali (The Cliffs) coast and into the Alakai Swamp. 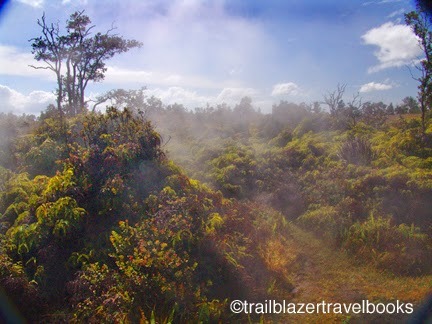 Even on a sunny day the Steaming Bluffs at the Kilauea Caldera add a wispy special effect to the fern forest at Hawaii Volcanoes National Park. Add a little overcast or moonlight to the day and would-be thriller directors can shoot a movie on the cheap. A trail hugs the rim of the crater and reaches the Jaggar Museum, about a half-mile distant. 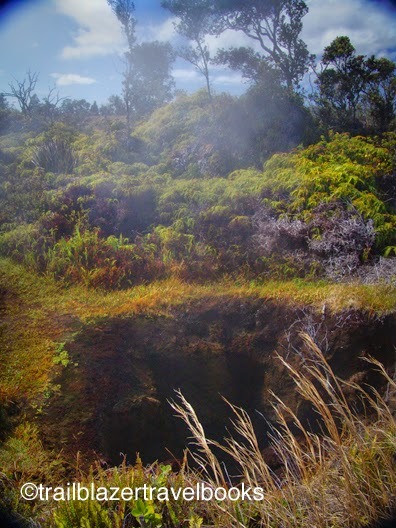 From the museum is a point-blank view of the towering plume of noxious gas that has been billowing since 2008 at from Halemaumau Crater, a smaller caldera within Kilauea. 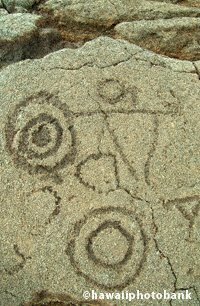 Keka'a Point, or Black Rock, is where spirits of the dead were said to launch themselves in ancient times to join their Polynesian ancestors in the other world. 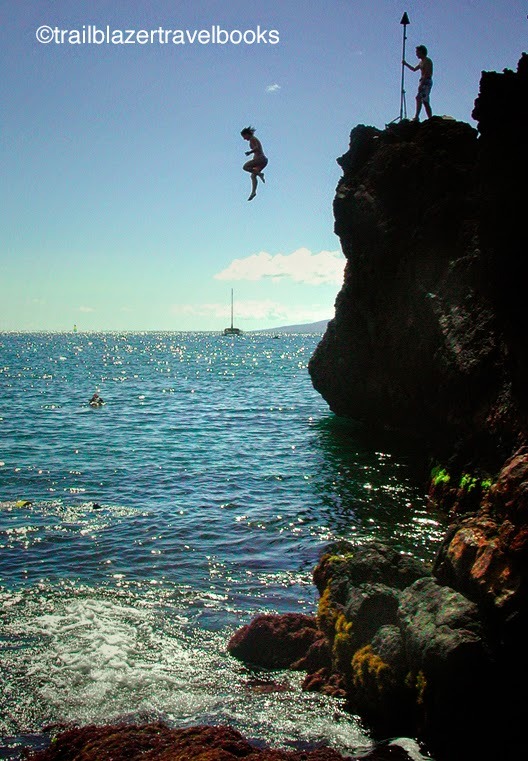 Today, jumpers are just aiming for the water, just offshore the Sheraton Resort along the posh resort path of Ka'anapali on the north leeward coast of Maui. The swimming is safe along the volcanic formation that forms the north end of the long sandy beach. Several lower leaping spots give newcomers options, without having to go to the top. 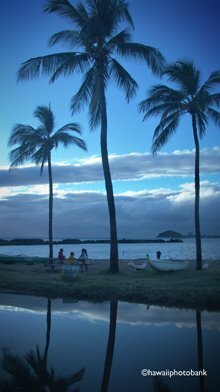 Dubbed "Dig Me" Beach in the 1970s, Ka'anapali is still a spot where tourists can strut their stuff. Complete directions in your Maui Trailblazer. 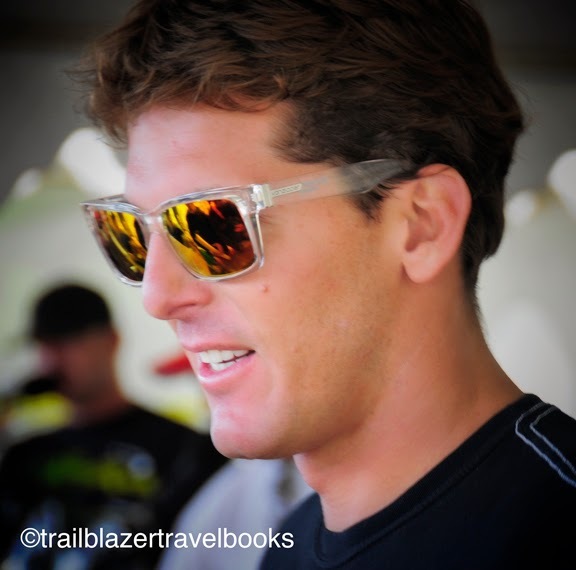 Trailblazer Travel Books extends its deepest condolences to Andy's family and friends. 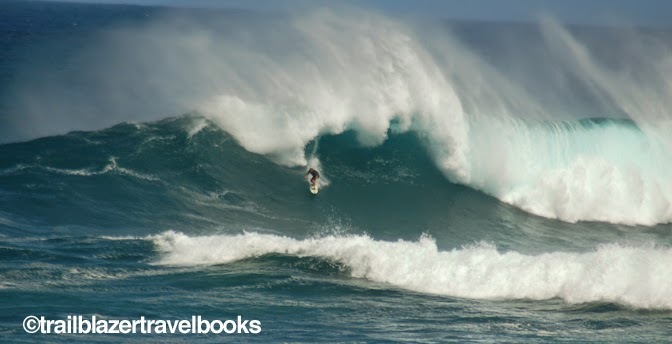 The 32-year-old legendary surfer died Tuesday morning in Dallas en route to Kauai from Puerto Rico. No official cause of death has yet been determined. The competitive surfing community has been stunned by the loss of this three-time ASP world champion. 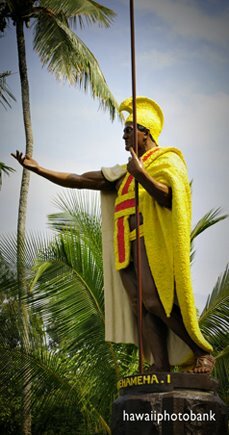 For more details go to Kauai's newspaper, The Garden Island or check out the special tribute video on SurferToday. 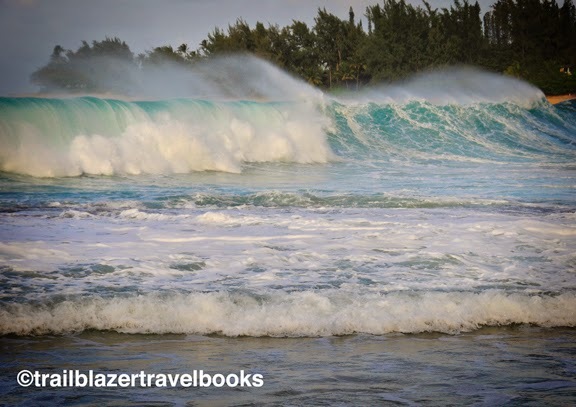 Strong rip currents and high surf expected on Kauai remaining in effect until Thursday. Surf along the north and west facing shores is expected to be 25 to 35 feet. Check out these links for up-to-the-minute conditions. 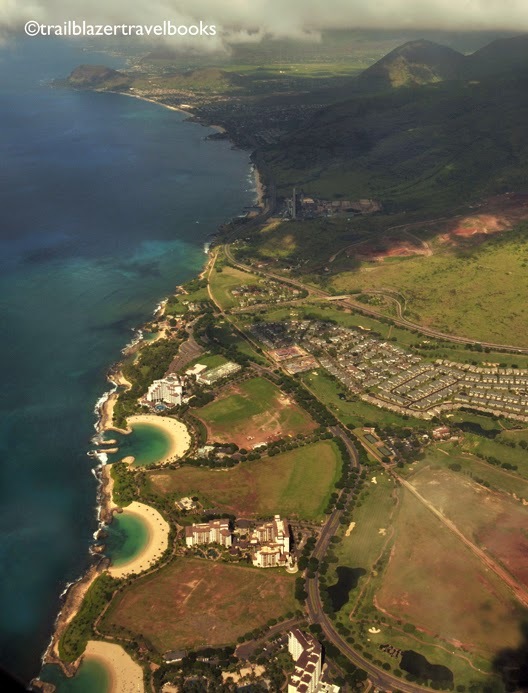 Obey safety precautions on all beaches and only swim where a lifeguard indicates it is safe: Poipu, Salt Pond, Lydgate and Kekaha should be smart choices at this time.